So admittedly, I’d never actually been to a geek convention until this event. I think the Alabama Phoenix Festival was a great convention to start with. The girlfriend and I got ourselves a day pass for Saturday (05-31-2014) and it’s a day neither of us will forget. The convention isn’t so large that it’s extremely overwhelming, and there was enough cool stuff there to keep you interested. I packed a backpack with water, snacks, and deodorant. These things are essential for conventions! Downstairs there was a room stacked full of tables where all types of artists and vendors were selling things. It was awesome seeing all of the talent that this convention brought together. I saw a 60’s bat-mobile toy that was pretty fantastic. It was 80 bucks. I salivated over it for a little while and then continued on. I then saw some walking dead sketches that I almost couldn’t resist. And then I saw these prints of Flying Monkeys. I don’t know exactly why I was drawn to them, but they are one of the coolest things I saw at the convention. I’m now the proud owner of these two prints! The artist’s name is Bryan Crowson and you can check out more of his work at facebook.com/ArtbyBryanCrowson. He will even draw you as one of your favorite comic book heroes! That pretty much sums up the awesomeness that was the show floor! Now on to the panels. Admittedly, I didn’t know if I was going to like this panel. I’ve always thought it’d be neat to write a book, but it’s never been something I’ve ever really been ultra motivated to do. I love writing blog posts about geeky things, and I promise I will continue to do so. But you never know, maybe one day I’ll write a book. We walked in a little late to this panel because google maps decided to start drinking the night before and continue all the way through the morning. 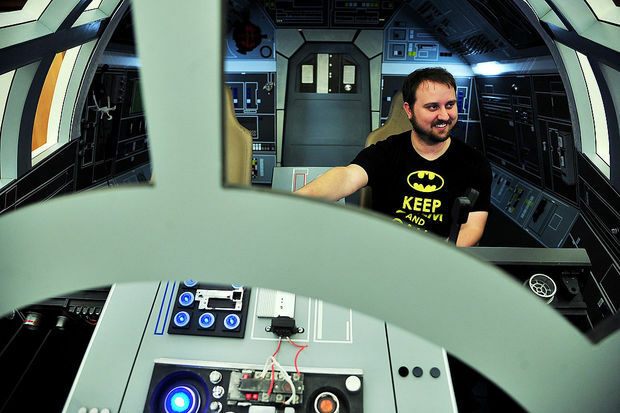 That’s correct folks, the picture of me in the millenium falcon is from a project where fans are building a full scale Millenium Falcon! I was surprised to find out that this project is happening practically in my back yard in Madison, AL. The goal of this project is simple, build a full scale replica of the Millenium Falcon as depicted in The Empire Strikes Back. Sounds easy right? Yea, I didn’t think so either. You may not know this but there are many discrepancies in the falcon’s layout throughout the films. Discrepancies vary from the angle at which the falcon’s ramp opens to problems with the cockpit itself. That being said, compromises have to be made. The guys talked about meeting Adam Savage from Mythbusters when Savage was touring Huntsville. Savage loved the cockpit, and it wasn’t even in as nice a shape as it was in for the Phoenix Festival. Savage was kind enough to sign the console. I asked them where they want its final resting spot to be. They want it to go at the Space and Rocket Center in Huntsville, or at the Science Center in Nashville. And if you’re wondering if you’ll be able to hit the wall in the cockpit and it fix a failing falcon, they’re totally doing that! The cockpit they have so far is only version 1.5. They are doing a lot of things to improve the build quality. It almost seems like a shame due to all of the hard work they’ve put into this thing. But they assured me that it will be much easier since they now have a Fab Lab. Check out the Official Site of the project and the site of Mind Gear Labs where they are doing all of this great construction! From Josh Mason comes a Star Wars fan film about Star Wars where there are Star Wars related memes, Star Wars styled costumes, Star Wars style fighting, and most importantly lightsabers! Josh Mason is a director that lives in Covington, TN right outside of Memphis. He directs many amateur films. Apparently everyone in his town seems to know about him. He talked about the cops coming out to the shoot after someone spotted them. They thought they were in some kind of trouble, but the cops simply showed up to watch. This film was hard to follow due to bad speaker levels in the theater. The music track had a much higher volume than the dialog track. This film was still fun to watch. It came in at roughly 26 mins and was by no means a masterpiece. It did look like they had a lot of fun making this film. When you have no budget, what do you expect? At least they are doing something they love! The Alabama Ghostbusters were having a big celebration at the festival for the 30th Anniversary of Ghostbusters. During this panel, they did a podcast while interviewing Dan Schoening the illustrator for the Ghostbusters Comic Book. A little after this panel, you could actually see a screening of Ghostbusters with the Alabama Ghostbusters. I believe they were adding in extra bits of interesting information about the movie during the screening. Additionally, you could visit Oak Hill Cemetery as ghost hunters did a paranormal investigation. I don’t know what to really say about this panel except that I wished I had gone to the Avengers Assemble panel instead. I feel like I would have enjoyed this a little more had Cadotte not been the only person on the panel of two talking. The only other person really talking was in the audience. I did some investigative work by doing some Facebook surfing and found it was his wife. She was totally a plant! The panel was suppose to be a bit more diverse. But the lady that was slated to be on the panel was no where to be found. There was some other man that was on the panel that is not listed in the schedule book. I did learn that the golden age was from the 30s to the 60s and some things in that time period shouldn’t be considered Golden Age. One such exception is Dune because it is so much richer than golden age style science fiction. Science fiction throughout most of this time was primarily available in magazines. Because of this, the stories seemed to be very sinusoidal with many ups and downs. I did make a mental note to read Ray Bradbury’s “The Martian Chronicles”. If I got anything out of this panel it’s that I definitely need to read that. Overall this was a great first convention. I had a great time. For the perspective of my festival mate, please see http://jennimoody.com. May the force be with you all! Jenni Moody liked this on Facebook. Michael Sylvester liked this on Facebook.